For many, the month of December has become synonymous with warm expressions of generosity and compassion, and few individuals demonstrate these qualities better than Tahmeko McDonald. 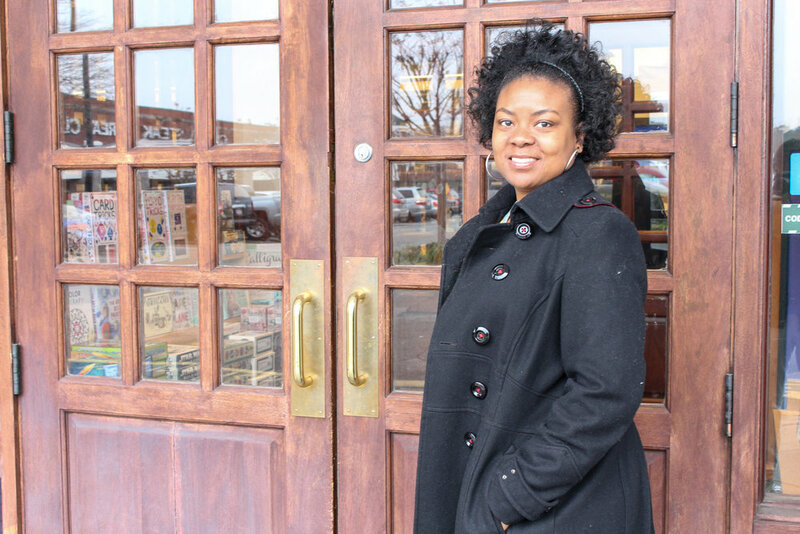 Born and raised here in Durham and a proud graduate of North Carolina Central University,Tahmeko lives out her love for the city by constantly seeking out ways to give back to the community that she calls home. Since July, she has prepared and donated two homemade lunches per month to be served at our employment readiness workshops. Her meals, ranging from chicken salads and sandwiches to pasta dishes and cheesy broccoli bakes, are consistently a hit among our participants and staff—there’s never a dish she makes that doesn’t elicit a smile and a plea for “seconds” from everyone in the room. One would never guess that, prior to volunteering with StepUp Durham, Tahmeko had never formally cooked for any group outside of her family. Perhaps it’s this homemade touch that truly stays with the people she serves. When Tahmeko first heard about StepUp from a flyer at work, she identified deeply with the organization’s mission to help people find work and wanted to learn more about how she could become involved. While her full-time job made it difficult to schedule volunteering shifts during workshop hours, she found that she could still contribute by providing meals for 12-18 participants and staff twice every month. This spirit of generosity permeates all aspects of Tahmeko’s life. Any conversation with her about what she finds meaningful quickly shifts the attention away from herself and onto others. When asked about what she would consider a perfect day, Tahmeko explains that doing whatever she could to make sure the people around her have their own perfect day would be more than enough for her. She is grateful for her family and especially for her daughter Monaé. “I really see myself in my daughter,” she says. “I can point to things in her life and say that I’ve been in your shoes. I know how you feel, and I know what you’re going through.” Now twenty-years-old, Monaé has become a lasting source of inspiration to her mother, always brightening Tahmeko’s day and, by extension, bringing smiles also to everyone that her mother helps out. At present, Tahmeko finds herself in a period of transition. After working in the operations department at an investment firm for about ten years, she is seeking a career change that would provide her opportunities to give back to her community in ways different from before. In Tahmeko’s bag is a book she recently purchased on financial accounting, from which she hopes to gain knowledge that might be of use to her and to others. She is also interested in taking additional classes or earning certifications that might open doors to work in human resources. According to her, reading and learning keep her productive while she searches for opportunities that she might pursue next. In the meantime, Tahmeko plans to take on more volunteer roles at StepUp, in addition to providing meals. She also volunteers with Dress for Success, a global organization that equips women with the skills and professional clothing necessary to succeed in the job search. As usual, Tahmeko will be spending her holidays with loved ones: cooking and eating as a family, laughing and playing games together, and visiting other relatives in the area. In addition to her financial accounting book, she also carries with her some Dr. Seuss books that she plans to give to her great niece. Of course, giving back remains important to her, particularly at this time of year. “A couple years ago,” she says, “I thought I should start volunteering, so I became involved with Angel Tree at Christmas time. And then I thought, how can I make this a year-round thing and not just helping someone only once?” Since then, Tahmeko has found true fulfillment in devoting her time to others and always seeks to do more. Volunteers like Tahmeko and many others serve in many ways as the foundation keeping StepUp afloat. We too are excited to see where their support takes us in 2017.